History: (Amazing Fantasy I#16 (fb) - BTS) - At some point in the past, "It's Amazing" had the Wizard appear on their program to perform chess tricks. (Amazing Fantasy I#16) - "It's Amazing" ran a report on various superhuman happenings, including the Baxter Building being levitated into the air, the Sub-Mariner being sighted in New York, the Hulk on a rampage in New Mexico and Thor battling the Executioner in San Diablo. Peter Parker and his Aunt May watched the program at their Forest Hills home. A later broadcast discussed Spider-Man's recent turn to fighting crime, reported on Ant-Man and brought up the "mutant menace." (Amazing Fantasy I#17) - "It's Amazing" ran a report on a young mutant (Scott Summers) destroying falling debris with optic energy blasts. Doug from "It's Amazing" called up Maxie Shiffman to see about booking Spider-Man on the program. Maxie had no luck finding Spider-Man, but suddenly Supercharger appeared and Maxie decided to offer him a spot on the program instead. (Amazing Fantasy I#18) - "It's Amazing" ran a report on Thor aiding the US Army in an anti-missile defense test. 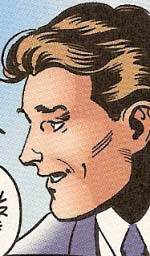 Spider-Man changed his mind and decided to appear on the program, which caused Doug to remove the evening's intended special guest, astronaut John Jameson. J. Jonah Jameson was outraged at his son being overlooked in lieu of Spider-Man. The Jamesons remained to watch from the studio audience, which also included Eugene "Flash" Thompson. Mac Sanders was host for that evening and Karen Little was scheduled to report on the new hero Iron Man, but Supercharger invaded the stage during the introduction and blasted Mac. Seizing control of the broadcast, Supercharger announced his intent to kill the audience to make a point about superhumans destroying the lives of normal people, but Spider-Man fought Supercharger and ultimately hooked up Supercharger to the station's broadcast tower, draining his power. The studio was badly damaged by the resulting blast, forcing the program to go off-air. The producers were unsure whether they would ever return to the airwaves. (Avengers III#0) - The host of the All-New It’s Amazing, Mac Sanders, and new co-host, Diane Cummings, hosted a special on the new Avengers team, reporting on their line-up, accomplishments, and popularity. When the Avengers went on a mission against Firebrand and the Flaming Sword, they allowed cameras from It's Amazing to record it while Mac and Diane provided commentary along with it. (Thunderbolts#29 (fb) - BTS) - "It's Amazing" ran a report on the robotic hero Machine Man; Hallie Takahama (Jolt) was among those who watched the program. (Avengers Annual 2000) - Mac Sanders and his co-anchor Diane Cummings interviewed Patsy Walker about her new book, Gidget Goes to Hell, asking poignant questions about her famous past. Then they reunited her with Hedy Wolfe. (Avengers Two: Wonder Man and the Beast#2) - While Diane had the night off, Mac reported from the Maria Stark Pavillion and greeted Wonder Man and the Beast as they attended a benefit. Mac queried Wonder Man on the subject of apparent lack of minorities in the Avengers. (Avengers Two: Wonder Man and the Beast#3) - As Wonder Man and the Beast fought with It the Living Colossus and Lotus Newmark, Mac and his cameraman Gus went to follow the action in a helicopter, but the Beast and Diane commandeered the vehicle to aid Wonder Man. Comments: Created by Kurt Busiek and Paul Lee. (Amazing Fantasy I#18) - Mac hosted the episode of "It's Amazing" where Spider-Man and Supercharger were scheduled to appear, only to be struck down by Supercharger when he took over the broadcast. (Avengers III#0) - Diane and Mac hosted a special on the Avengers, discussing the team's recent history and their controversial new members. By special permission from the Maria Stark Foundation, their crew got to follow the Avengers (Captain America, Firestar, Iron Man, Justice, Scarlet Witch, Thor, Vision, Wonder Man) into battle against Firebrand and the Flaming Sword gang. (Avengers Annual 2000) – Mac Sanders and Diane Cummings interviewed Patsy Walker about her new book, Gidget Goes to Hell, asking poignant questions about her famous past. Then they reunited her with Hedy Wolfe. 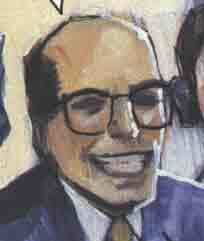 (Amazing Fantasy I#17 - BTS) - In his capacity as producer of "It's Amazing," Doug called Maxie Shiffman to see about having Spider-Man appear on the program. 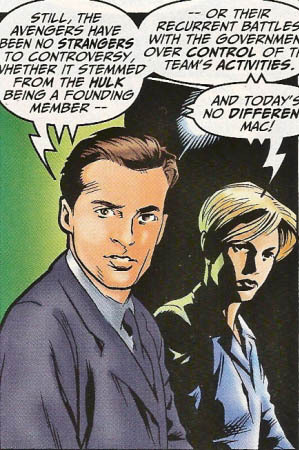 (Amazing Fantasy I#18) - Doug removed astronaut John Jameson from "It's Amazing"'s broadcast after Spider-Man arrived to make his appearance. Unfortunately, Spider-Man's subsequent battle with Supercharger wrecked the studio. (Avengers Two: Wonder Man and the Beast#3) - Gus was the "It's Amazing" cameraman who accompanied Mac Sanders to the Maria Stark Pavillion. He followed Mac to their helicopter in the hopes of following Wonder Man's battle with It the Living Colossus, but the Beast and Diane Cummings absconded with their vehicle.